Every dollar from membership goes directly to conservation efforts that positively impact the quality of life in our local communities. Since 1967, Lake Forest Open Lands’ mission remains devoted to the acquisition and stewardship of our natural landscapes, and to ensuring all generations have a meaningful, lasting connection to nature and our land. With access to 6 preserves encompassing 800 acres and 12 miles of walking trails, 365 days a year, we hope you walk in nature. You will receive so much from the land you help to protect. As a member, you receive invitations to special events and programs, are offered discounted rates for all event and camp programs, and receive our member newsletter, Grass Roots. And all members are offered an annual membership premium gift—a small token gesture of our thanks to you! All memberships are renewable annually on May 1st and expire the following year on April 30th. This fully tax-deductible gift supports our operating expenses over the course of the year. Our programs include land restoration work, environmental education and public advocacy. Lake Forest Open Lands' annual budget also includes necessary expenses for the administration of these programs. Your gift, in any amount, is greatly appreciated and tax-deductible to the full extent of the law. Your unrestricted gift to Lake Forest Open Lands will be used in support of all of these programs, or you may restrict your gift in support of a particular program or activity, by noting your restriction on the giving form. Lake Forest Open Lands Association is a 501(c)(3) organization. Stock Transfer Information, DTC #0226, Account NT2-015539 for the benefit of Lake Forest Open Lands. 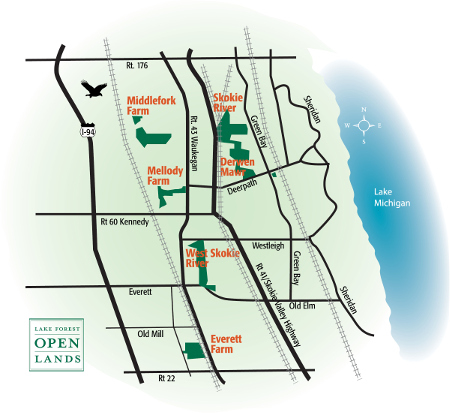 Please call Lake Forest Open Lands at (847) 234-3880 x17.